Personalized guidance and insights. Your favorite songs and apps. 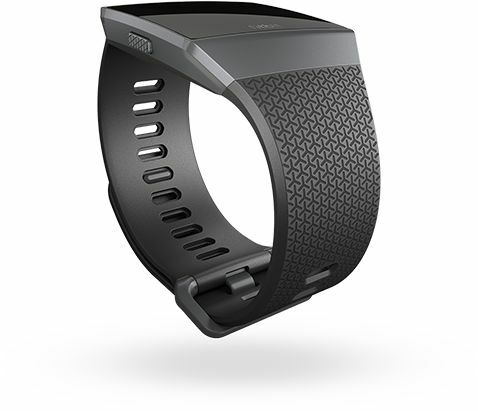 All the features you love from Fitbit. This is the watch you’ve been waiting for. Designed to give you more guidance than ever, Ionic serves up personalized workouts that play on screen and guide you through every move. 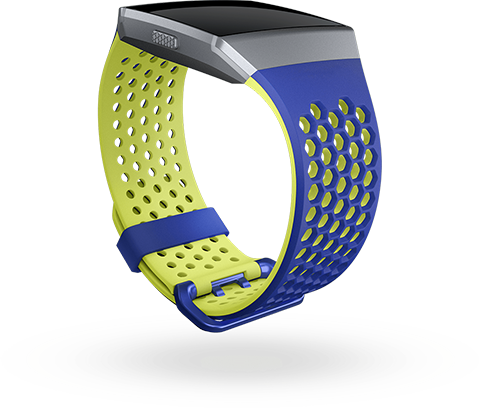 Multi-sport modes let you track specific workouts like weights, runs and rides. In Bike, Run or Hike mode, use built-in GPS to see pace, distance and other key stats on display. When you’re done, you’ll get a complete performance summary that shows elevation climbed, split times and a map of your route. Ionic uses GLONASS to tap into global satellites, so no matter where you are—in the middle of a city, the mountains or nowhere—you get the best stats. 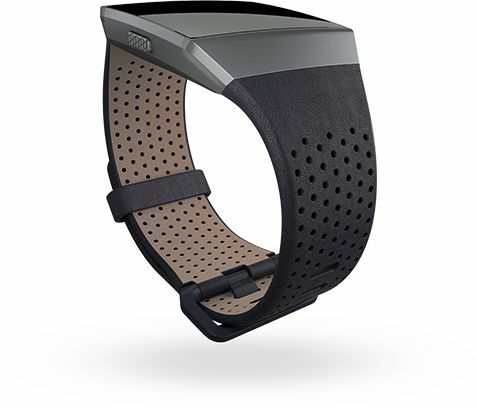 The GPS antenna is integrated into Ionic’s watch case for a stronger satellite connection and more accurate stats. Whether you’re on the elliptical, out for a jog or doing sports like basketball or tennis, SmartTrack™ automatically recognizes your exercise and records it for you in the Fitbit app. During workouts, check your real-time heart rate zone to see whether you’re in the Fat Burn, Cardio or Peak zone to optimize your intensity and dial in your effort. 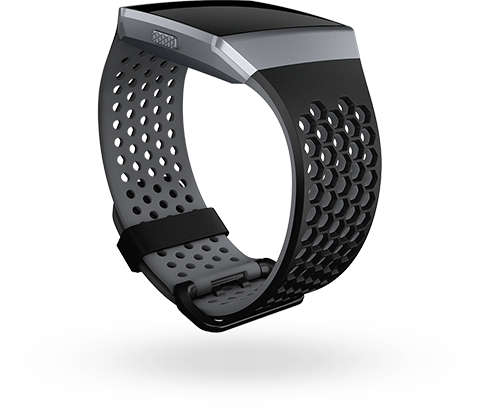 Ionic was built water-resistant and with enhanced swim tracking capabilities. Just start Swim Mode to record your laps, stroke style, calories burned & more. If you forget to record it, SmartTrack will have your back by tracking swims for you. When you run, so does Ionic. 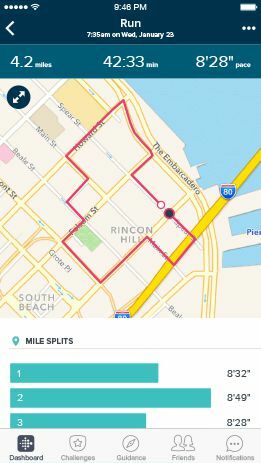 It recognizes when you’re running and automatically enters Run Mode—starting GPS so you can see key run stats on screen. Plus, it automatically pauses when you do, so your pace and duration are spot on for accuracy. All you have to do is lace up. Find moments of calm throughout the day by following personalized guided breathing sessions based on your heart rate. 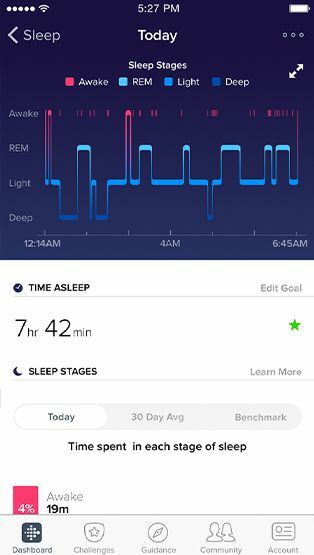 Ionic helps you better understand your sleep quality by using PurePulse® heart rate to track your time spent in light, deep and REM sleep stages. 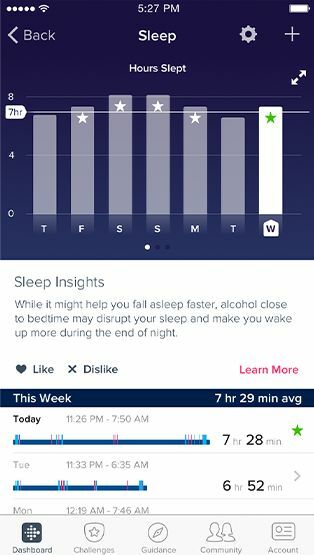 When you set a sleep goal in the Fitbit app, you’ll get a recommended sleep schedule—complete with bedtime reminders and a silent alarm—to help you keep a consistent routine. See valuable insights about your sleep to get a clearer picture of your nighttime habits, how your routine might be affecting your sleep quality and what you can do to improve. Learn how your cardiovascular health and fitness is progressing by tracking your resting heart rate and following your heart rate trends over time. 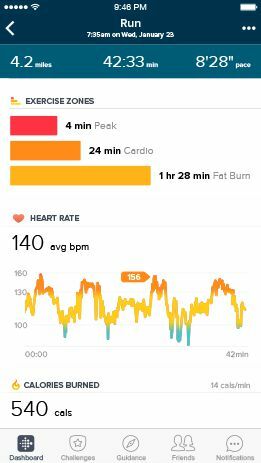 Get a better understanding of your cardio fitness level and learn how you can improve over time with a personalized Cardio Fitness Score. Stay in tune with your cycle. 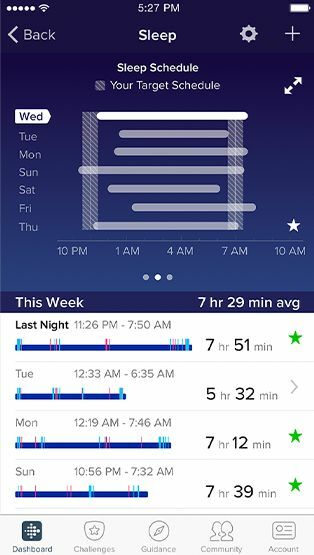 Use Ionic with the Fitbit app to log your period and record symptoms, track your ovulation & discover patterns in your cycle. Ionic stores and plays 300+ songs—giving you the extra edge you need to tackle tough workouts or take on the day. Take your listening experience to the next level with Deezer on Ionic. * Make and sync your own collections to get the perfect soundtrack for your workout or enjoy curated playlists that keep you motivated during any activity. *Using Deezer requires a Deezer Premium account. Ionic seamlessly connects to wireless Bluetooth head­phones like Fitbit Flyer so you can hear music & audio coaching on the go. Get instant access to important updates for weather, sports and more & use your favorite apps. Discover and download your favorite apps for fitness, finances, social, sports & more—all from the new Fitbit App Gallery. Make payments on the go, right from your watch with Fitbit Pay. Upload your debit or credit card, then use Ionic to make purchases anywhere that accepts wallet-free payments. Stay connected to what matters most with texts, calls and calendar alerts. Easily respond to messages with quick replies (Android only)* and see notifications from apps like Facebook and Gmail. With unique designs that range from sleek and understated to fun and fitness-focused, there’s an Ionic clock face that fits your style. 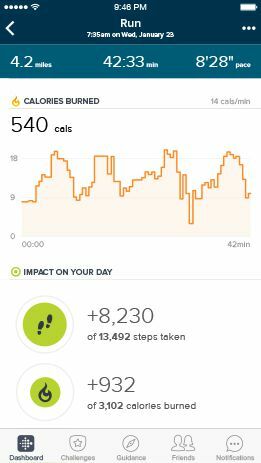 Ionic automatically syncs to computers and 200+ Android, iPhone & Windows devices over Bluetooth—so you can easily see the complete picture of your health on your Fitbit dashboard. Two-toned band creates a sporty, stylish look that’s ready for anything. 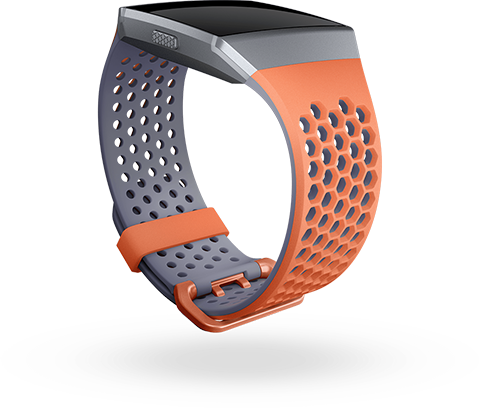 Take on any workout with a breathable band and secure double-buckle. Hand-crafted with high-quality Horween leather and other materials. Full-grain leather and a subtle taper offer an elevated look, day or night. Made with natural materials that mold to your wrist and develop an aged patina finish over time. From weekends to workouts, it’s an accessory that goes where you do. Water-resistant with a sleek aero pattern that’s casual and cool. Comfortable, durable style that goes the distance. *Quick replies available for Android only.